Xochimilco has been on my bucket since long before anyone had a bucket list. I first read about this wondrous, watery, flower strewn oasis on the south side of Mexico City in one my early readers that featured chapters on interesting places around the world. I’m not even going to guess how long ago that was, but I did finally get there on a recent trip to Mexico with Canadian tour specialists Adventures Abroad on a tour led by the inestimable Victor Romagnoli. The tour was the inaugural Central Mexico tour featuring Day of the Dead festivities throughout the area. It was one of the best tours I’ve ever been on and if you want to know why, read this post on nine reasons I thought Adventures Abroad was the way to go. The visit to Xochimilco was but one small part of a much bigger picture, but for me, a very important part. 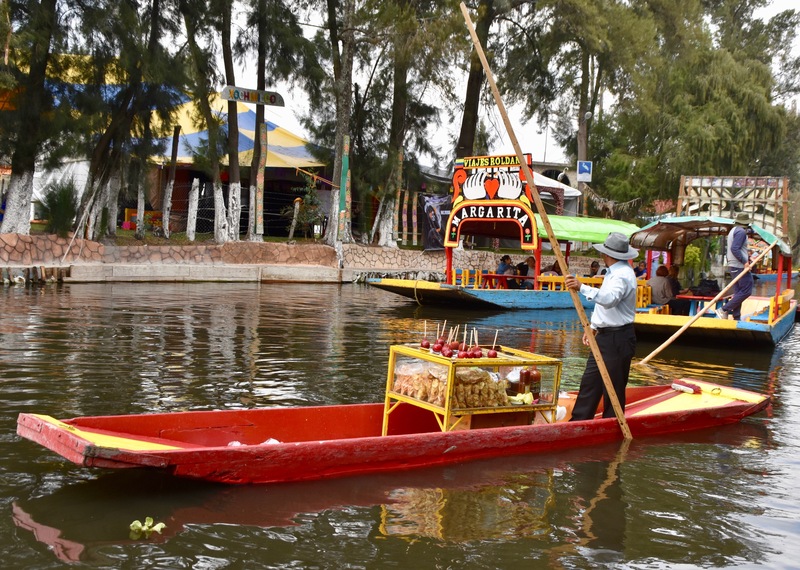 The lacustrine landscape of Xochimilco, located 28 km south of the city, constitutes the only reminder of traditional Pre-Hispanic land-use in the lagoons of the Mexico City basin. 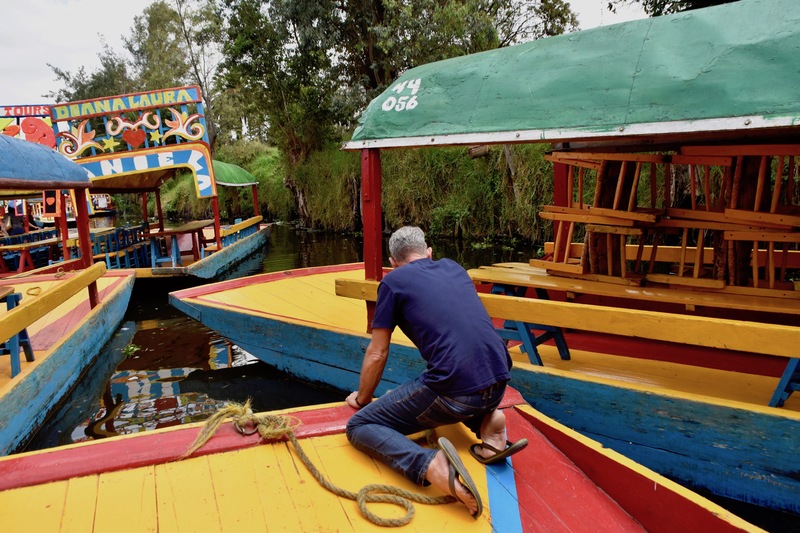 In the midst of a network of small canals, on the edge of the residual lake of Xochimilco (the southern arm of the great drained lake of Texcoco), some chinampas or ‘floating’ gardens can still be found. Parts of this half-natural, half-artificial landscape are now an ‘ecological reserve’. Unfortunately it is an eco system under tremendous pressure and the last remnant of the once huge Lake Texcoco. 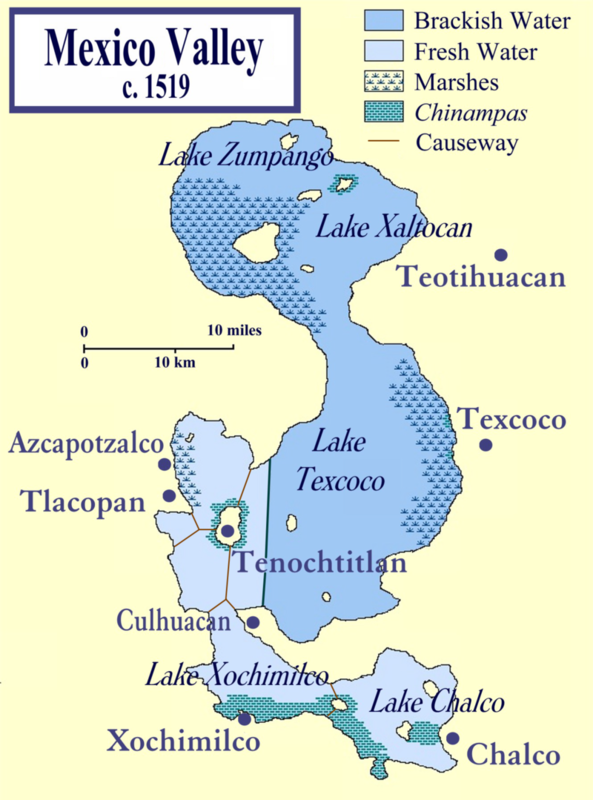 This is a map showing the extent of Lake Texcoco at the time of the arrival of the Spanish. Lake Xochimilco is technically a separate lake, but it was all one connected waterway that stretched for well over 60 miles (90 kms.). Note the city of Tenochtitlan sited on an island which is now the heart of Mexico City, but all the water that surrounds it is long gone, a combination of deliberate drainage and natural evaporation. The result is a city built not on bedrock, but dried mud which explains why earthquakes do more than their fair share of damage when they strike. Now look at the area around Xochimilco and in particular the green areas which are chinampas, an ingenious type of man made island that was wonderfully fertile and productive. The waters around Xochimilco were quite shallow and the various Mexica peoples around the lake figured out that if they staked out a small rectangular plot and wove a fence around it, they could then fill in the compounded area with soil and vegetation. Thus the invention of the ‘floating island’ with man made canals separating them. Long before the Army Corps off Engineers was screwing up almost every water related project it undertook, the people around Lake Texcoco were successfully using dams, dykes and sluice gates to regulate the water level to ensure that the chinampas did not become too water saturated or too dry. Eventually, roots from vegetation on the islands would grow into the lakebed and become rooted. When the Spanish arrived there were over 9000 hectares (22200 acres) of chinampas providing a great deal of the food for Tenochtitlan and the other cities around Lake Texcoco. While I could not get an accurate figure for the number of hectares of chinampas remaining today, most articles I read made it clear it is a tiny fraction of what there once was. So that’s the depressing part. Now for the fun part. 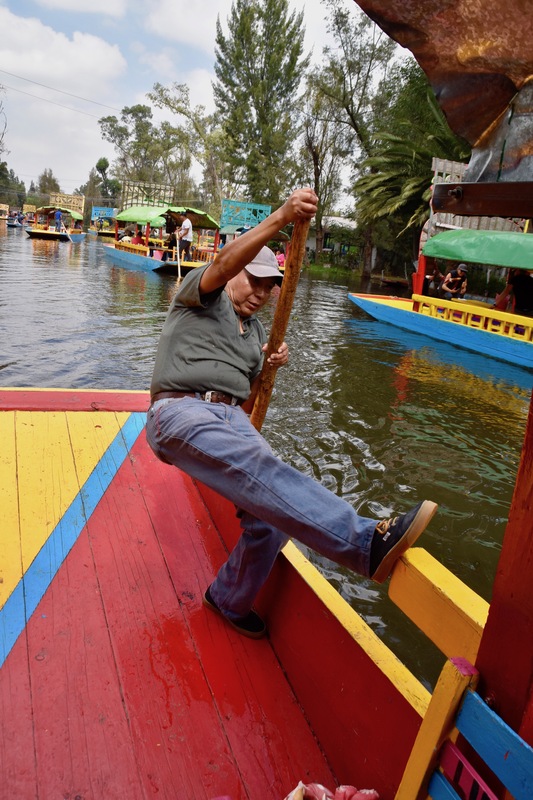 What little there is left of the original chinampas is well worth traveling to see, so much so that a boat ride on one of flat bottomed trajineras has become a staple of any visit to Mexico City. That does create problems. The canals are not very wide and there are a zillion people who want to ride them so the result can be total chaos. There are any number of reviews on TripAdvisor and other online review platforms decrying the Xochimilco experience as a mad house, a ripoff, a tourist trap etc. etc. 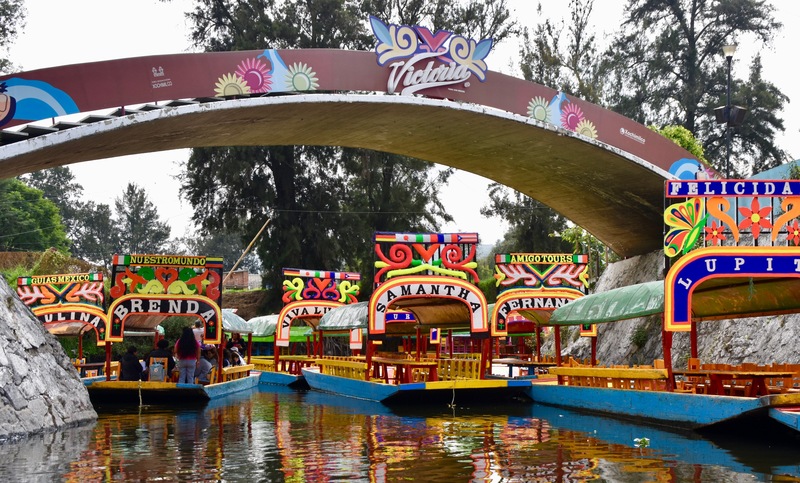 First off, Xochimilco is definitely not a tourist trap; just like neither is the Eiffel Tower, Niagara Falls or the Tower of London. There is a reason these places are so popular and it is this very fact that creates the paradoxical effect of seeming to be something a lot less than it really is. In other words, it’s the way you experience these things that adds or detracts from the potential enjoyment of the experience. 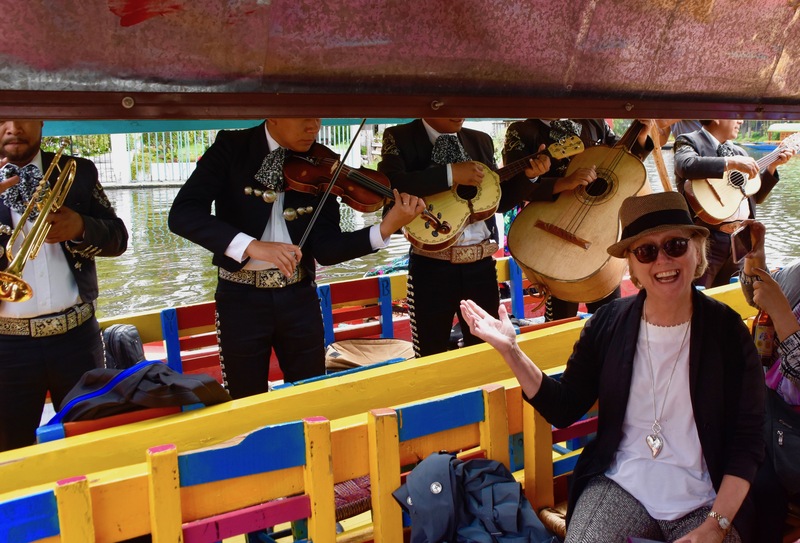 For me, the number one criteria for getting the most out of a visit to a place like Xochimilco is to go when other people are doing something else, like working. 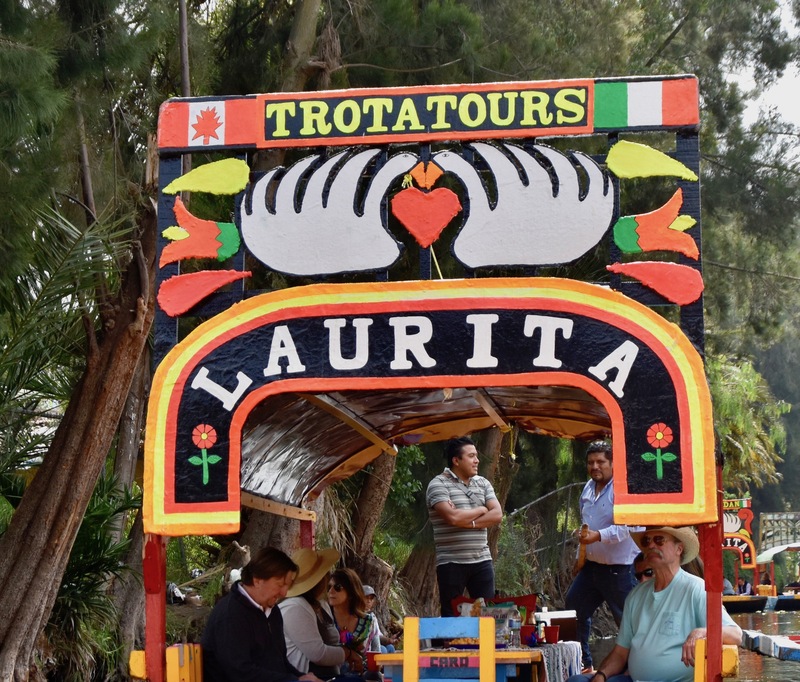 The vast majority of visitors to Xochimilco are Mexicans who celebrate any number of occasions by renting a trajinera. That means the place will be packed on the weekends and unless you like mayhem, my best advice is DON’T GO ON THE WEEKEND. Fortunately, Victor knew this and took us to Xochimilco on a Monday when most normal people were back to work and nursing their hangovers. There are a number of embarkation points and I have no idea which one we went to, but I do know that the parking lot was immense and we were the only bus in it. As we walked down to dock I could see a seemingly endless line up of trajineras and it was then it dawned on me of just how crazy this place would be if even half of them were out on the water. The trajineras all rent for a flat hourly fee which I understand is now around 500 pesos or just over $26.00USD. That’s a pretty good deal if you’ve got a larger group, but still not bad if you are just a couple. We saw lots of trajineras with only two or three people in them. Victor did the negotiations and soon we were boarding the Patricia. That’s my wife Alison being helped aboard. As you can see each trajinera has a row of wooden chairs on each side with a table in between. Once everyone was aboard we needed to pass under this bridge and somehow make our way through what would appear to be a successful naval blockade. However, Victor, acting as a modern day Moses parting the waters, got us through, miraculously not getting his hands crushed between boats. So now we were on one of the main canals and everybody could relax. 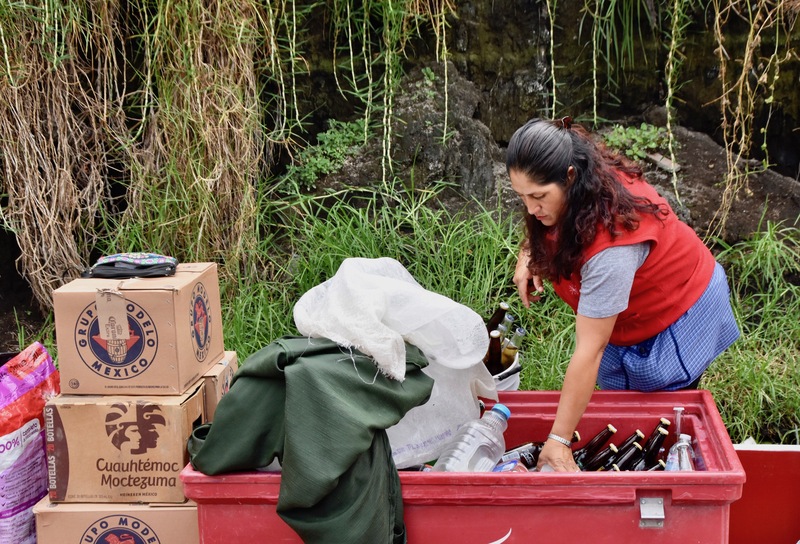 We stopped to pick up a bucket of refreshments from a vendor who filled it up with beer, water and sodas and just handed it over. It works on the honour system and you pay for what you drink when you give her the bucket back at the end of the trip. So my greatest fear – taking a boat trip without beer, was allayed. Needless to say there were no beers left when we returned her bucket. The trajineras are propelled by a man at the rear with a pole – that’s it. No oars, no motors and blissfully, no noise. This our Patrician polesman. By now you can see that we’ve made our way to more open water and we can sit back with our beers and just enjoy the bright colours, festive atmosphere and good company. I particularly liked the reflections on the water from the other boats. 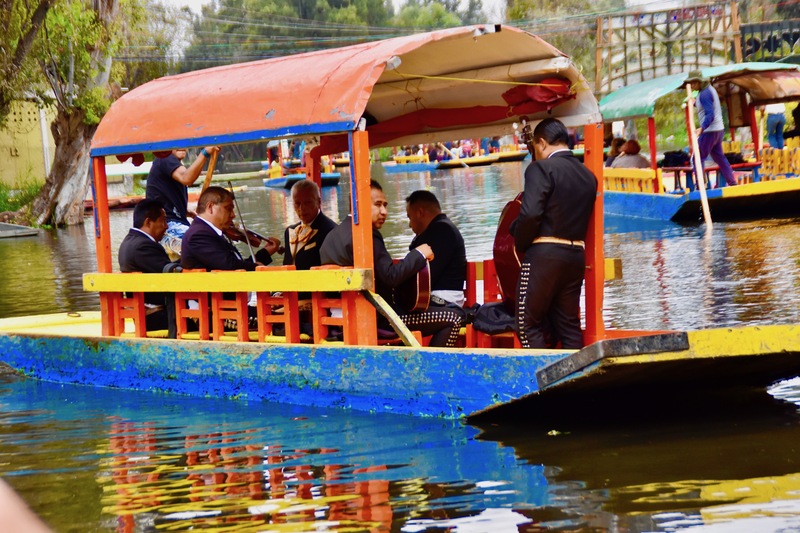 What makes a Xochimilco trip even more enjoyable is the constant music from the floating mariachi bands that ply their trade on the water. Victor summons one group over and we hear, for about the thousandth time, Cielito Lindo, but who can ever get tired of singing along to “Ay,Ay, Ay, Canto y no flores”. Here is a video I got from YouTube that pretty well is exactly what we experienced that placid Monday morning in Xochimilco, except I think our band was a lot better. If you don’t like mariachi music, you need to have your pulse checked. Sure it’s a bit corny, but it’s also just plain fun. The mariachis are not the only game in town or I should say, on the water. After the mariachis we were entertained by this duo of xylophonists and I’m pretty sure the guy on the left was not from Canada. 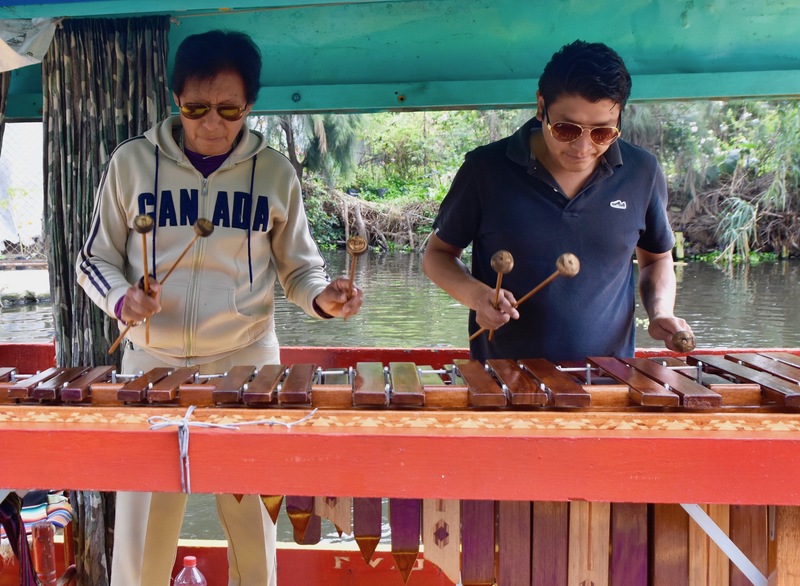 In Mexico these instruments are typically played by two or sometimes even three players which makes for a more complex rhythm than you’d get from just one player. Lionel Hampton they’re not, but still, they get your feet tapping. In addition to the musicians, the water was alive with people offering everything from soup to nuts – really! This guy was selling candied apples among other things and someone wanted to buy one until Victor advised him that the coating was not sugar candy, but rather hot chilis. In this festive atmosphere it was easy to almost think you were on a ride at Disney World or Universal Studios, until you looked around and realized that this was a real place with real people going about their business of daily living like this bargeman taking flowers to the markets that make Xochimilco a popular destination for everyday Mexicans. Or that people live on these islands and just like everyone else they need regular services like garbage removal. 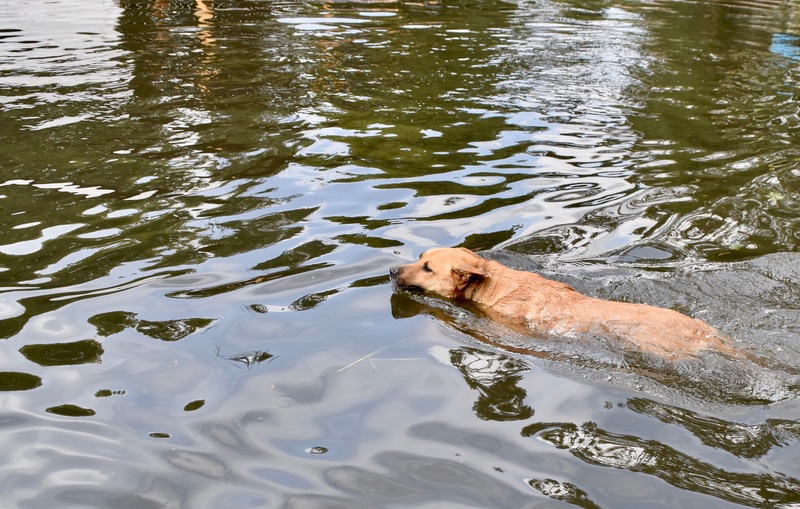 Or that busy dogs need to go about their business by crossing from one side of the canal to another. 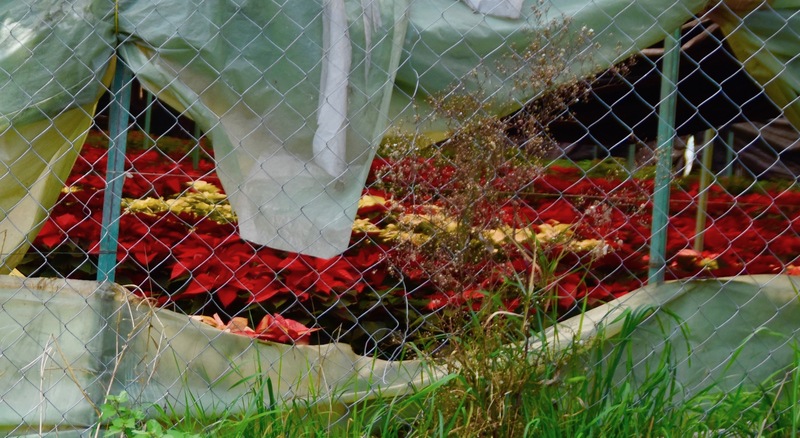 On both sides of the canal there were many greenhouses and just getting a glimpse inside one I could see poinsettias, native to Mexico, which would soon be heading to North American markets and maybe even our house for the Christmas holidays. 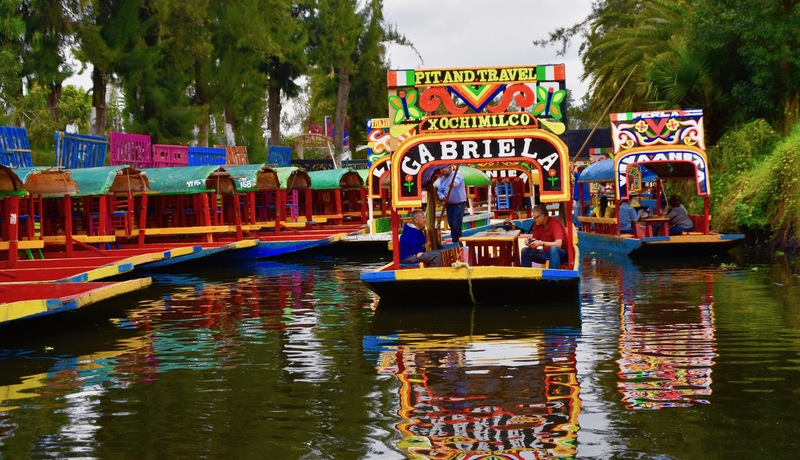 If you like a touch of the outré, Xochimilco has that as well in a small island that has become famous world wide as Islas de las Muñecas or Island of the Dolls. As you glide silently by you see that suddenly one part of the shoreline is bestrewn with dolls – dolls in the trees, dolls hanging from vines, dolls staring sightlessly from the ground, dolls everywhere. But these are not the type of dolls little children play with. On closer inspection these are creepy dolls in the best tradition of Chucky from the movie Child’s Play. If you follow the link you can get the full story, but the short version is that it all started with a man who found a drowned little girl at this spot and near her a floating doll which he put up in a nearby tree. Since then many more dolls have appeared and apparently the people who live on these islands really do believe that they are somehow possessed and come alive and talk to each other. Needless to say nobody on board demanded that we stop and get a closer look. There are other on land attractions that you can stop at including this museum dedicated to Xochimilco’s most famous and rarest inhabitant, the axolotl. The axolotl is one of nature’s most unusual creatures – a giant salamander than never morphs into an air breathing adult like other amphibians. 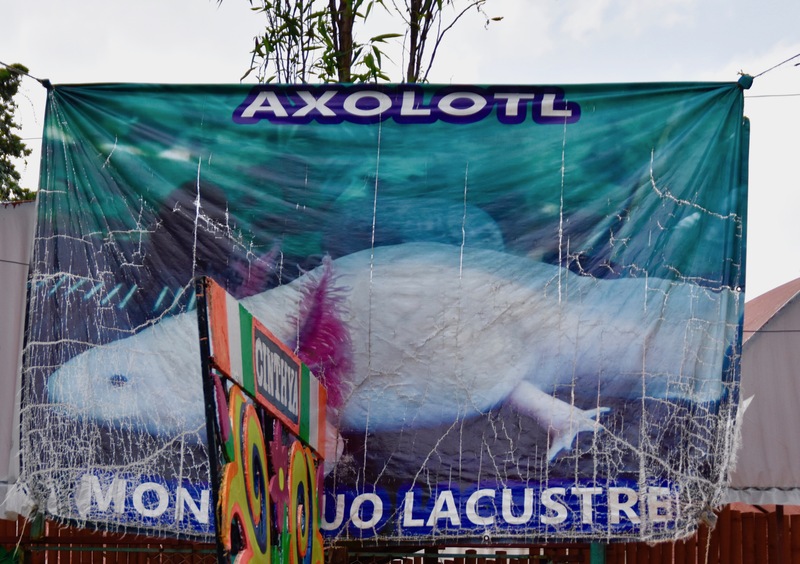 It is unique to the waters around Mexico City and as they have disappeared and become polluted so have the axolotls of which few if any remain in the wild today. Once so common that they were a staple of the Aztec diet they are now found alive only in a few places like this museum. I don’t want to end this post on a down note, because aside from the sad fate of the axolotls, there was absolutely nothing about this excursion that didn’t have a touch of magic. Yes, Xochimilco is overrun with tourists, pretty campy and somewhat garish, but to me that was more than outweighed by the bright colours, the music, the good feelings I always get just being on the water, the camraderie and chittery chatter of our group and of course, the cold Victoria beer. Thank you Victor for taking us here. It is a day I will long remember and cherish. Oh, one last thing, Canada recently legalized marijuana and I was surprised to see that they knew about it already in Mexico as evidenced by this Canadian flag sporting a marijuana bud, instead of the traditional maple leaf. Many thanks again to Dale of The Maritime Explorer for sharing his experience with us.